Lately I’ve been a bit obsessed with kitchens and I don’t really know why. 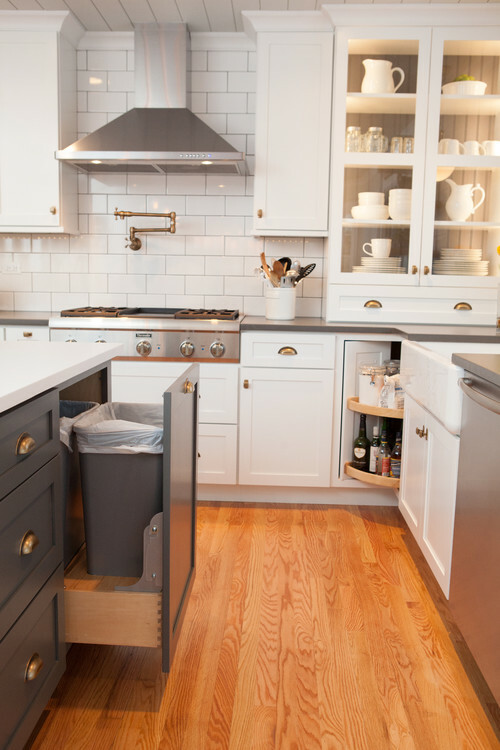 Maybe it’s just the combination of the functionality and aesthetics of a kitchen that draws me in. Or maybe it’s simply because the kitchen is the heart of the home. 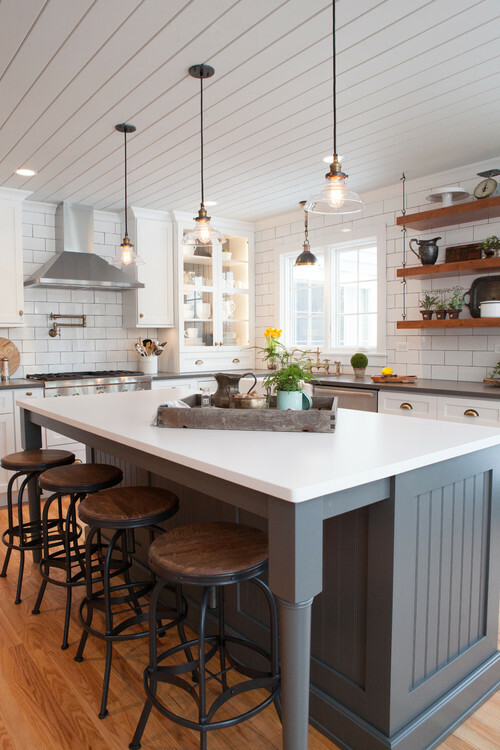 Today’s farmhouse kitchen is beautifully decorated in gray and white. The kitchen island bar stools remind me of those seen at old-fashioned ice cream parlors. Photo by Advance Design Studio, Ltd.
A custom range has one of those convenient pot filler faucets that I would love to have. You see them a lot on the show, Fixer Upper. 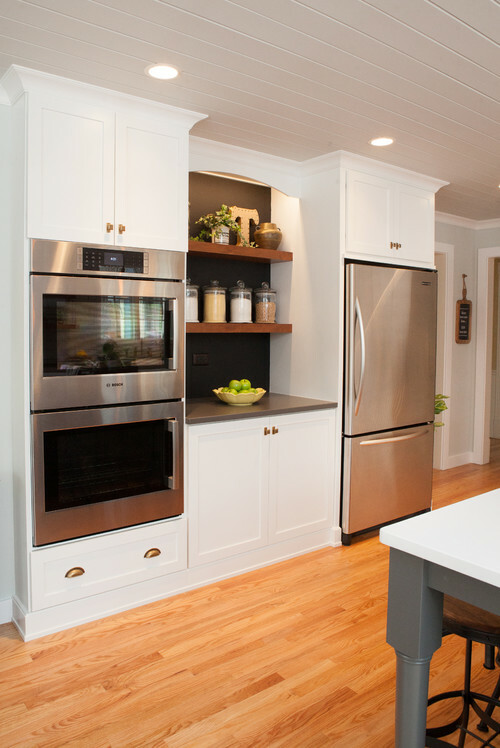 A double oven balances out a stainless steel refrigerator on one end of the kitchen. The ceiling treatment is a unique touch and adds a bit of texture. 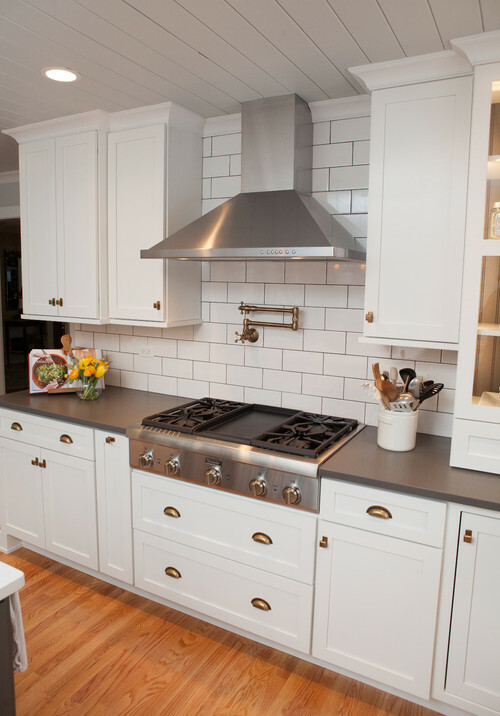 I like that the homeowner chose bronze hardware instead of silver, which might have been the obvious choice to match the gray counter tops. Lights inside the glass front cabinets make it easier to view the pretty dishes inside. 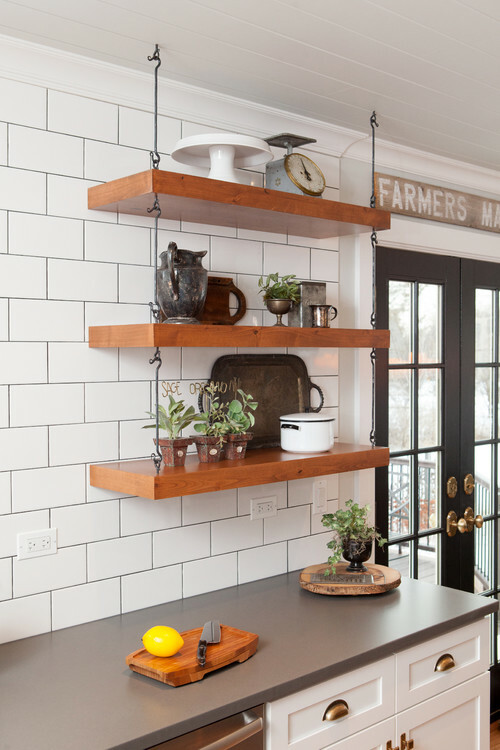 Open wood shelves add farmhouse appeal against the subway tile. A rustic farmer’s market sign hangs above the French doors leading outside. 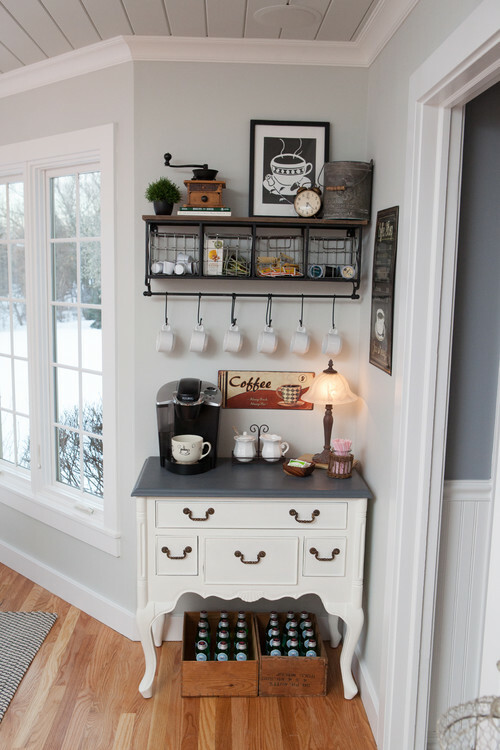 A small dresser becomes a convenient coffee bar in the dining nook. Plenty of storage is available in this fresh farmhouse kitchen with its warm wood floors. 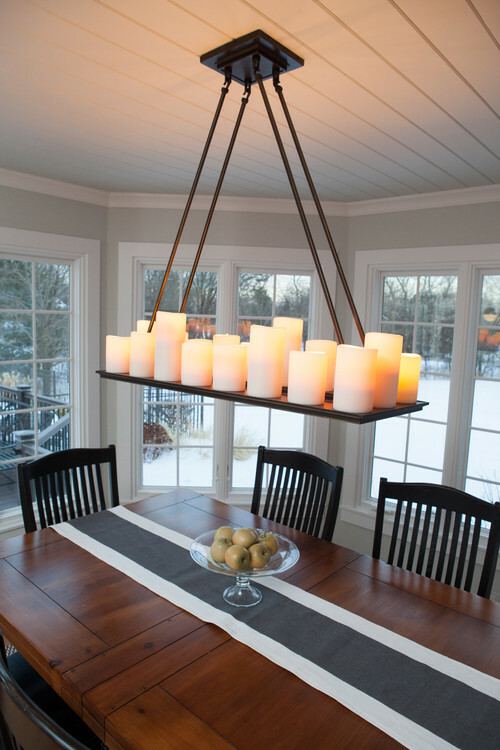 The dining nook is equally charming with its bank of windows and candle chandelier. 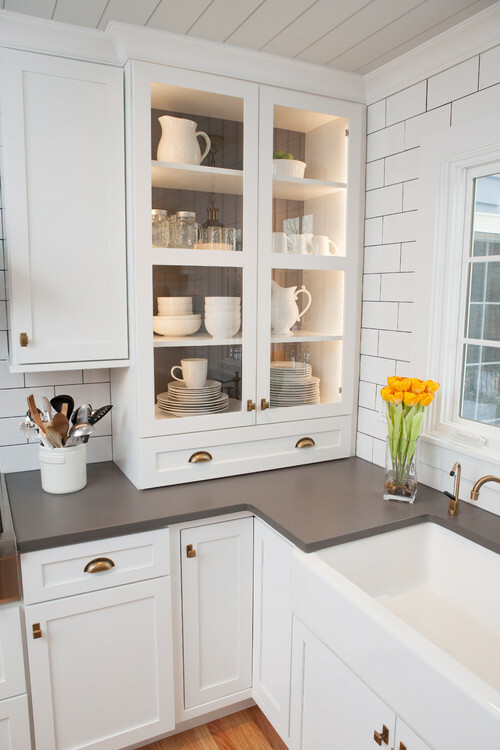 You can see more of this charming kitchen by Advance Design Studio, LTD over at Houzz. Lots of good ideas for a kitchen update! Love the storage unit over the coffee station. A pot filler would be lovely, thank you ever so much! Alas, we have a cold and wet snow falling here in Central Indiana. Maybe I’ll visit Miss Deb in Ocala for the day…ha! similar on chains holding a large stained glass ‘window’.